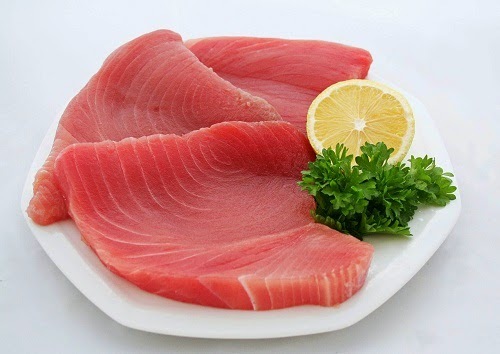 Ocean Tuna is popular food of Asian area such as Japan, Korea and Taiwan. Every Year Phú Yên catches nearly 1800-2000 tons of this fish. This Best Vietnamese Food is mostly export to the foreign. Some fishes are processed at local area. 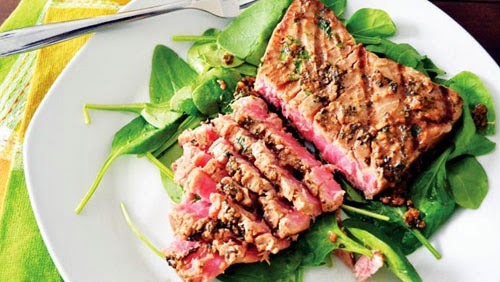 The fish meat is fresh red and slice to small pieces and enjoy with mustard or soya bean. You can eat it with some herbs like perilla, spicy basil and broccoli or peanuts and rolling baked cake. This Best Vietnamese Food is easy made. 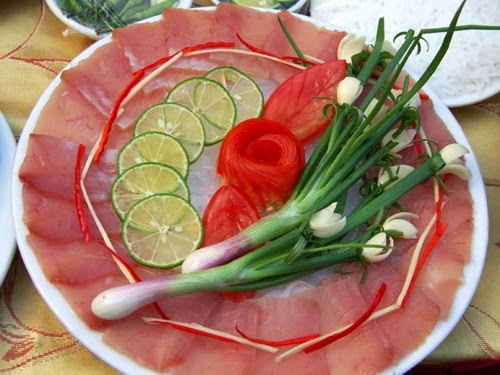 It is not only served at luxury hotel and restaurants but also barbeque or outside party. Moreover, their eyes are also specialty food that people rarely enjoy it. 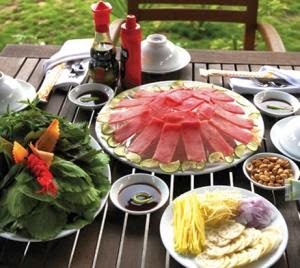 If you have chance to visit Phú Yên provinces, do not forget enjoy this food. Phú Yên province has one man that is called as the king of ocean. That man is Năm Ry. The man spends all most his life on the ocean and he is the first one hunting ocean tuna in this province. He told that he used to hunt shark for the starting time. One day, he realized some foreign ships illegally hunt fish in Vietnamese zone. After cutting their hooks, he saw their hooks are weird and different with him. He tried to use their hooks to hunt fish. As a result, these hooks lured ocean tuna. Then, he changed to catching tuna instead of sharks. At the first time, the price of tuna is very cheap. It is quite 10000 VND per kilo, so people are not attracted with this hunting. However, people changed to this job in 1992 due to one company buying this fish with high price. And then, it quickly becomes one of Best Vietnamese Food of this sea province. If you want to know more about this Best Vietnamese Food and its original history, you should go to Phú Yên. I am totally fall in love with fish, and I did not miss a chance to taste this delicious ingredient when I had a chance to visit Phú Yên. Never ever regret with this decision. Make sure you will not miss it when visit here. Good Luck for your Trip.